"Be prepared Son, be prepared…"
---- Bruce Willis in the Movie "The last Boy Scout"
NM Jomo Pitterson first learned the game while still in 1st form at Campion, in 1985. After being drafted unto the Campion High School team by then Captain NM Holness, he has never looked back. He went on to eventually lead Campion to three straight Workers Bank Chess Titles in 1989, 1990, and 1991. He achieved his National Master Title, while still in High School, in 1992 and won the Jamaica Open of that same year. He is without question the most "Theoretically prepared" player in Jamaica in terms of Chess Openings and technical, concrete endings. His strongest qualities are his fighting spirit even in inferior positions, his Chess Work ethic, and last but not least his great powers of calculation, which are rivaled only by NM Duane Rowe. While he is skilled at calculating concrete tactics, he is satisfied with slight edges and more comfortable in strategic, predictable positions where he can slowly steer the game towards positions where his ability to calculate will become of paramount importance. This many time National Champion is the current reigning National Blitz Champion, and recently placed second in the 2002 National Chess Championships, behind his Nemesis, NM Shane Matthews. He last won the national Championships in 1999, ahead of NM Mark Holness, who placed second, and also won the titles back in 1992 and 1993. His Chess Career as a Junior was remarkable and he won the National Junior Championships for a record 5 times. he also won the Barbados Open Junior in 1993 as well as the Caribbean Junior Champs in 1994. He holds the distinction of being the first player to win Junior titles in three Caribbean Countries within a single year. 1994 Caribbean Junior Champs; Placed 1st. NM Pitterson recently placed second behind NM Shane Matthews in the 2002 National Chess Champs and will soon defend his Blitz Championship title against FM Warren Elliott. He is currently training with the Jamaica National Olympic chess in preparation for the Chess Olympiad, in Bled, Slovenia. 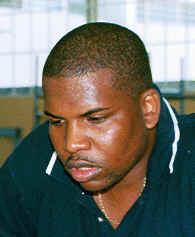 National Master Jomo Pitterson is without dispute, the greatest Junior chess player that Jamaica has ever produced. He remains inside the big four, which also includes, NM Shane Matthews, his Nemesis, and FM Warren Elliott, his training Partner. This (5) Five Time Junior champ and three time National Champ takes his chess very seriously. He is living proof that chess is more about hard work than raw talent. The final outcome of his fascinating rivalry with the "Magician" NM Shane Matthews might yet determine his final place in Jamaican chess History.